When you teach your children to bake, they learn more than how to make delicious treats. Baking helps improve math and reading skills, encourages teamwork and teaches children about the "science of food". But more importantly, baking together builds fond memories and creates traditions that last a lifetime. 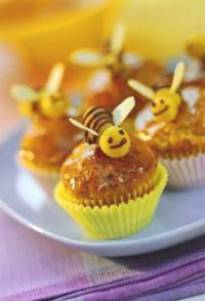 In "Treats For Kids" you'll find scrumptious kid-friendly recipes. In this Baking Tips Section for "Treats for Kids" you'll also find more useful techniques and activities that will help children have a safe, fun and rewarding time in the kitchen. Follow these easy steps to ensure a fun and safe learning experience with your "young baker" every time. When choosing what to bake, look for age-appropriate recipes. For example, consider the number of steps and ingredients involved as well as the level of difficulty. If you have chosen a more difficult recipe, simply prepare parts of the recipe beforehand to streamline the process. Unplug and clear all unnecessary appliances from your workspace. If using the kitchen counter, have a step or stool nearby so your child will be able to reach the workspace easily. Have all baking tools on hand, including plenty of paper towels and sponges for any spills. Before starting the recipe, read it through with the child so he/she understands the steps involved. Specify which steps he/she will be doing and which ones you will be helping with. Before starting, make sure you and your child wash your hands very carefully. Let the kids do everything from measuring, pouring and stirring ingredients to the final touches of decorating the dessert. Don't worry if they lose interest or concentration. Send them away, finish the step and call them back. Enjoy the time together. Make the clean up as fun as the actual baking. Make sure you and your child get a chance to sample what he/she has prepared. When children are allowed to use the kitchen for the first time, they enter a foreign world with new equipment, rules and experiences. To make your child's baking experience as safe and rewarding as possible, we've put together a list of kitchen safety tips. Be sure to print them out and go over them together - then let the baking begin! Ask mom and dad for permission to use the kitchen. Make sure an adult is nearby to help, especially when you are using the oven. Always ask for help when you turn on the gas or electric oven. Use oven mitts when touching anything that has been on the stove, in the oven or microwave. Don't try to carry hot things that are heavy. If you burn yourself, run cold water on the burn right away and call for help. Place hot things on heatproof mats. Remember to turn off the oven when you are finished. Ask mom or dad to show you how to use a knife. Keep your fingers away from the blades of sharp knives. Always pick up knives by their handles. Use a cutting board so that knives won't slip. Always cut away from your body with the sharp edge facing away from you. Never walk with a knife pointing out in your hand; always carry it down at your side. Roll up your sleeves, tie back your hair if it is long, wash your hands and put on an apron. Wipe surfaces clean with a damp cloth. If you spill something on the floor, wipe it up right away Clean up the kitchen as you go along. Put ingredients away as you finish with them; wash, dry and put away all utensils; wipe counters and tables. When you are finished baking, make sure everything is clean and in its place.